If I spend too long on the preamble, you’ll get bored, so fire up 3ds Max and get stuck in. I’ve presented the videos using as little jargon as possible, and aimed them at someone with no Max experience, so whatever your skill level, you should be able to generate an entry for this competition! The first thing you’ll need is the model. There’s an Ad at the top or bottom of this page to take you to the competition website where you should read carefully the rules, then download the model. I’ll just reiterate just two of the rules: Firstly, you must own the copyright on any images you use – we’ll cover that later. Secondly, you must use “iRay”. If you are new to Autodesk 3ds Max, iRay is a recent addition that provides a “GPU accelerated, physically correct, photo-realistic rendering solution”. Or in English, wicked pictures. If you spent a few extra dollars when you bought your graphics hardware, it’s about to pay off. All the work you see in the video is completed on my HP 8570W Laptop with an NVIDIA Quadro K2000M graphics card, so it’s not a top-end workstation by any means. This short video will introduce you to a few basic viewport and object manipulation tools. It’s worth spending a few minutes practising moving between viewports and seeing how the different commands work. When you are comfortable, just re-open the scene without saving the changes you just made and you’ll be ready to take on the next step. 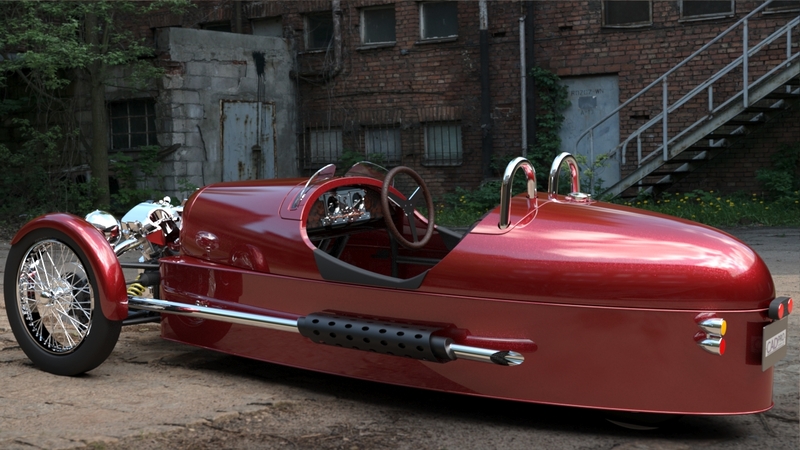 I visited http://hdrmaps.com and looked through their selection of images for something I could use as the setting for the Morgan. (The images I use in the video are from the “freebies” selection, but there are some stunning images for less than 10 euros. My personal favourites are under the HDRE section called “Urban”.) Wherever you get your backgrounds from, make sure you read their terms and conditions. I know it’s the second reference I’ve made to ownership of copyright, but you must be certain you can use these images; otherwise you could be disqualified from the competition and get yourself in trouble! This next video shows how a background photo is brought into Max, and then how you reconstruct the camera that took the photo. All too often you see renderings where the perspective of the model and the background don’t match, and there’s no excuse when there are some simple tools for getting it right. Seasoned 3ds Max users will know the old Camera Match tools, but 3ds Max 2014 introduced a new “Perspective match” function that is so quick and easy to use, you’ll wonder how you ever lived without it. Having used Max for a few years, this has to be among my favourite new tools of 2014. You could spend weeks reading and studying lighting and environment design, so I’m going to take a real short-cut here and just use two image files to create everything we need for the scene. In the previous step, you probably downloaded images from the hdrmaps.com site. In this next video, we’ll use the JPG backplate images for the background, and an EXR file for the environment. When you look at a material like polished chrome, its colour comes from its surrounding environment. To a lesser extent, the same is true for shiny colours like car paint, so getting the environment right will make a huge impact on your renderings. In the following video, the “environment” image will be wrapped around an imaginary sphere that surrounds your model. This means that anything shiny on the Morgan will reflect the environment. By having the background image and the environment image of the same courtyard, the rendered output from this next exercise is surprisingly rewarding. 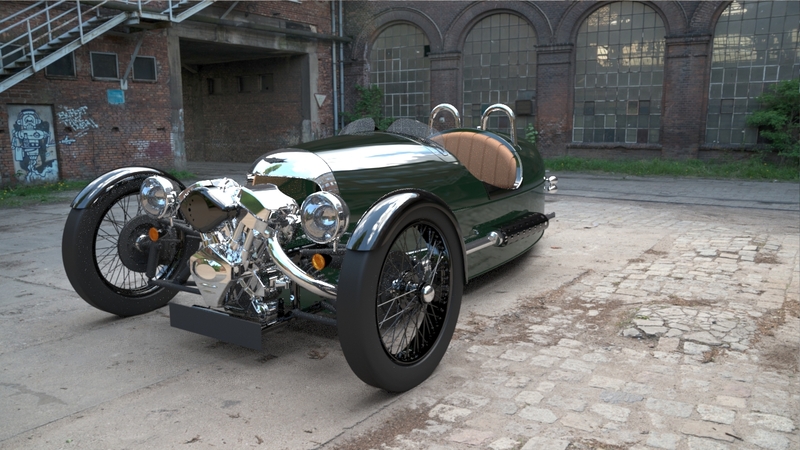 iRay is the rendering engine you’ll need to use for the competition, and it’s all set up ready to use when you first downloaded the model of the Morgan. If you visit the www.morgan-motor.co.uk website and have a look at the “Classic” model range of 4-wheel versions, you will see they come in a range of engine variations – one of which is the awesome V8. As rendering engines go, iRay is the V8. It’s designed to take advantage of every available electron in your computer and use it for rendering. If you just hit “Render” you will notice Windows (and other background apps) will become very sluggish because iRay grabs all your hardware for itself. There are settings that allow you to use CPU and/or GPU rendering, but I don’t cover these here. The other unusual thing about iRay when compared with traditional rendering engines is that it never “finishes” a rendering, it just keeps refining the solution. This is the default setting in the Morgan scene, so remember to hit Cancel unless you plan to sit there for ever. Once the rendering has been cancelled, the image will stay on screen so you can inspect it, or save it if it’s one you want to keep. The ground that the Morgan stands on is another bit of iRay magic: You need something that will catch the shadow of the Morgan, but still lets you see the background photo. We typically use something called a “Matte” material, but that feature has not yet been exposed in the interface of Max, so we need a workaround. Download this plugin called iRay Manager. The following video describes the download and installation process (you’ll be surprised how easy it is!). The last segment of this video looks at an iRay material and what you can do with it. From pearlescent two-tone metallic-fleck car paint to leather and glass, you should find a template to help you put your personal mark on the Morgan. Gimp is a fully featured image manipulation tool along the lines of Photoshop and others. You shouldn’t need anything else to complete the work for the competition. Good luck, and I hope you enjoyed your first project in 3ds Max. Got a varies stuck in your Inventor BOM?